What happens when you lose your vioce? To figure out why you lose your voice, let’s start by covering what happens when your voice is acting normally. So if all sound is vibration, something has to start it off. In a violin, it’s the friction between the bow and strings that causes the strings to vibrate. In a tuba or trumpet, it’s the vibration of the musician’s lips against the mouthpiece; if you just blow into a tuba without a proper embouchure (funny music-playing face), you’re not going to get any sound out of it. In you, it’s the vibration of your vocal cords that produce sound. Aw, ain't it cute? The little vocal cords are so relaxed. Uploaded by Samir at en.wikipedia and used here under the GFDL. That’s them. But it’s actually a two-step process. 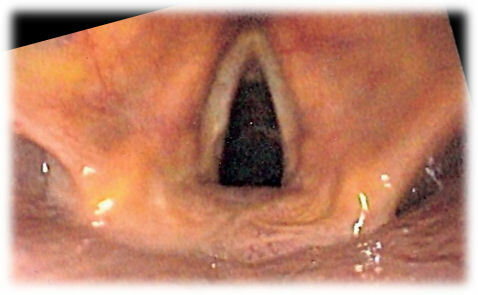 Step one: Tighten the vocal folds. This is like tuning a guitar; you can change the pitch of your voice based on how taut your vocal cords are. If you put your hand on your throat and sing a low note and a high one in quick succession, you can actually feel your muscle rotating as it adjusts the length of your vocal cords. Step two: Vibrate those vocal folds. Now, you might think, based on step one, that you use your muscles to wiggle them back and forth really fast. Nope. You vibrate your vocal cords by blowing air through them. The more air, the louder the sound, the sooner you have to take a new breath. So based on this, there are two possible ways to lose your voice. You can run out of air–which, unless you’ve had the breath knocked out of you, is a pretty straightforward problem to fix–or your muscles can crap out. And that’s generally why you lose your voice. The muscles in your larynx are just like any other muscles. If you use them hard enough, long enough, they’ll strain and, bam, you’ll lose your voice. Of course, this is just for run-of-the-mill I’ve-been-screaming-at-a-football-match type voice loss. Anything that messes with those muscles will cause you to lose your voice, and that can include things like aging, smoking (seriously, don’t smoke), damage to the larynx during surgery or even a tumor. But unless you’re at risk for one of those things, your voice will come back once the strained muscles have had time to heal. In the meantime, I recommend carrying around a small whiteboard and whiteboard marker (It’s got good visibility, you can write easily and quickly, and you can write large enough that people not directly next to you can read it.) and learning how to finger spell. ‹ PreviousHow much do you talk?